Enjoy one of Japan's favorite summer games! A new one-piece design makes these scoop holders even easier to use. Now you too can enjoy Kingyo sukui, or goldfish scooping, a favorite activity at festivals across Japan. Scoop up a goldfish (real or toy) with the scoop and it's yours! 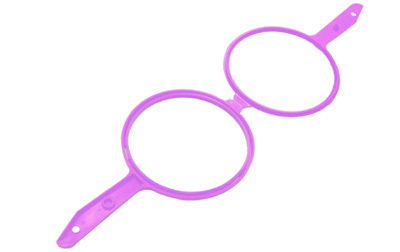 These are scoop holders only - see below for replacement papers and other related products. A new one-piece design makes these scoop holders even easier to use. Now you too can enjoy Kingyo sukui, or goldfish scooping, a favorite activity at festivals across Japan. Scoop up a goldfish (real or toy) with the scoop and it's yours! Trickier than it looks, the scoops have thin sheets of paper that easily break. You can choose different thicknesses of paper to make the more more challenging, or easier for younger kids. With these plastic holders and replaceable papers (sold separately) you can introduce this game to as many students or friends as you like. 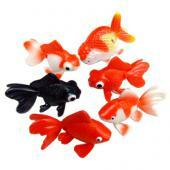 We also sell packs of disposable, one-use scoops, rubber "superballs," and rubber goldfish (see below).